Learn a simple trick for getting a lighter spring look, plus nailing the details with The Gig Line. 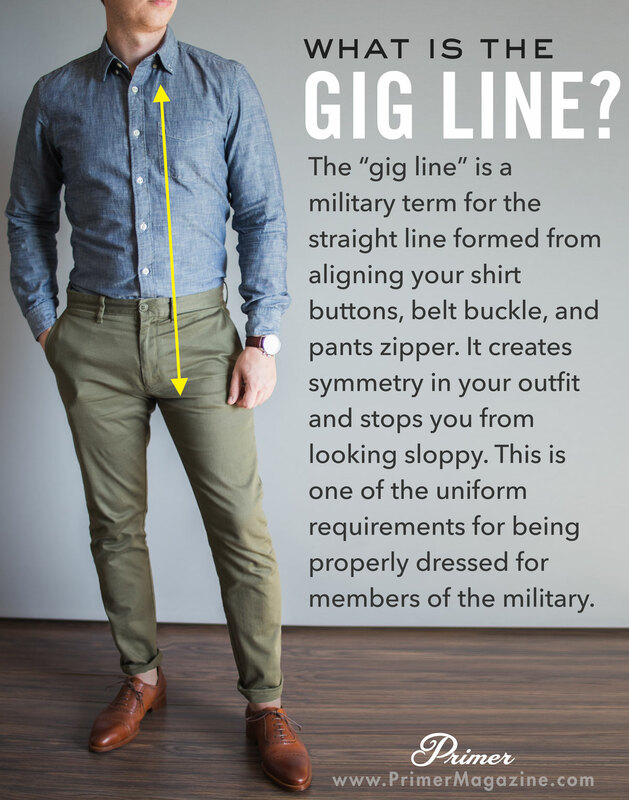 The “gig line” is a military term for the straight line formed from aligning your shirt buttons, belt buckle, and pants zipper. It creates symmetry in your outfit and stops you from looking sloppy. This is one of the uniform requirements for being properly dressed for members of the military. Nice look, but needs a belt, especially if you are going with those shoes. Obviously you can wear a belt with any outfit but I like the look of his one without. Minimal or cleaner. Add me as well. Some loafers may have worked, but those shoes need a belt with those textures and rolled up pants. exactly. Please don’t take my comment as a criticism; I really like what you do on this blog – I’m a bit out of your target audience, but I did get my son to follow as well! I understand some people are on a budget. But no one can can’t cut corners and think they are going to look stylish by not spending on quality. Getting the perfect fit is easy. It’s QUALITY that is king. It’s what sets you apart from the rest. PS: Decades ago, the sockless look started among the Northeastern prep set as a means to show off a tan. Don’t go sockless if you have pale skin. It looks ridiculous. Like most of these amateurish “fashion” blogs, you are doing a disservice to people who genuinely want to look stylish and want to be noticed by the right people. looking like every average joe out there. And that’s what I see when I see that picture. Someone who doesn’t understand style. Really great and simple getup. I tried on the button down version of this Chambray in J Crew and really liked it, I’ll defiantly get one shipped over to the U.K. I usually go for a more casual look with white sneakers. But I’ll have to invest in some captoes and try this look out for myself. Wearing dress shoes like those with unstructured, lower priced chinos like those is not a good look. Stick with loafers or drivers. If you are going to wear the shoes pictured with casual pants, opt for better chinos- like Incotex or Theory. Awesome!!! 😀 That’ll look great. Zac, what did you think of the fit of the jcrew chambray? 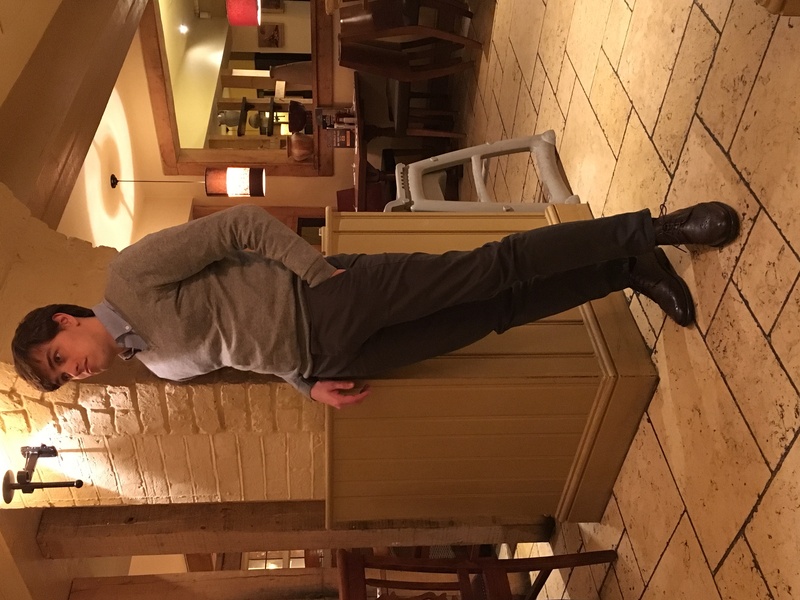 I tried on the slim fit and was really impressed. The fit is trim but not too constricting. But depending on personal preference the regular fit may be a better option for some. But even with shipping costs, like I said I’ll be getting one. So defkitly worth it. Are you in the market for a new Chambray? I’m similar height and weight to yourself: 5’11 and 143 lbs. The slim fit would probably be the best bet for you then. I’d still go try one on at a store if you can. But I think you’ll really like the J Crew offering. Like I said before the quality is really good for the price and worth the extra money. I like the overall look of this Getup with the exception of the lack of belt or socks. I’ve never been a huge fan of the sickles trend with dress shoes. Boat shoes and sneakers are one thing but I think this trend makes the overall look appear incomplete and sloppy. At the very least I definitely think the legs of the pants should be unrolled if you go sockless here. In fact I would prefer going with a light pair of sperry or van type sneakers with the untucked shirt and unrolled hem on chinos, if I’m wearing in public. Just seems like random elements from a casual Getup are being combined with a somewhat more formal one and it leaves me grasping for an identity for this outfit. A bit of a confused look but nothing a belt and socks or change of footwear couldn’t fix. I’m saying the combination of pants and shoes and no socks isn’t working for me. I think the shoes need socks and a belt in the context. I think if you’re gonna roll you pant legs and go sockless you need to switch to canvas sneaker or boat shoes and untucked the chambray. Again my opinion. If I may ask, why do you (just about) always roll the cuffs on your pants? Also, when I roll mine, they always seem to stick out on the sides and don’t stay close to the leg. Could that just be from my pant leg being a looser than yours? Hey Paul, the pant roll has been in style for a few years now. I actually read your comment while waiting in line for a coffee and the 5 people in front of me both men and women had some kind of pant roll. It started in sneaker culture so people could show off their kicks and has permeated the rest of the spectrum as well. Of course if it’s not your thing feel free to let those legs down! I find it works better with a slimmer / tapered leg. Anything wider and it makes the pant legs look like pipes. You can also look into the Pin roll which will give you a tighter/slimmer cuff. My whole problem with the pant roll this is it take away from the true cut and fit of the pants. I understand showing off selvedge stitch of jeans but it’s extremely difficult to shop online for pants when the visuals are all rolled pant legs and you can’t get an accurate idea of how the pants wear on the body. Just my two cents. Now in the right setting, spring, summer casual beach or lake wear with canvas sperry’s or vans, feel free to rock the roll! If it has loops, I need a belt… But to each his own. 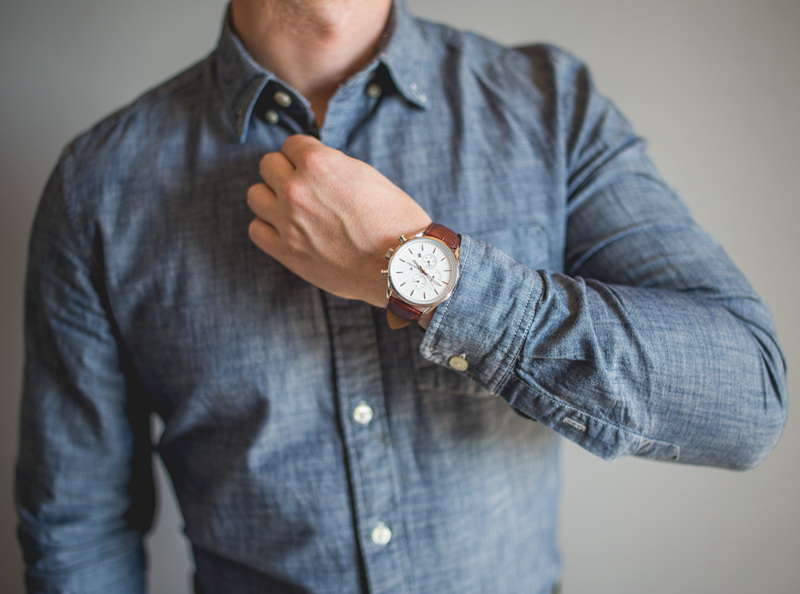 Great chambray shirt! Just went belt-less the other night on accident (forgot to pack a belt for a weekend away), ended up really liking the look. Something I just never thought of. I’ve been wanting to get myself a pair of green chinos! After seeing this…I’m liking this look except for the fact that I would add a belt (just my opinion). 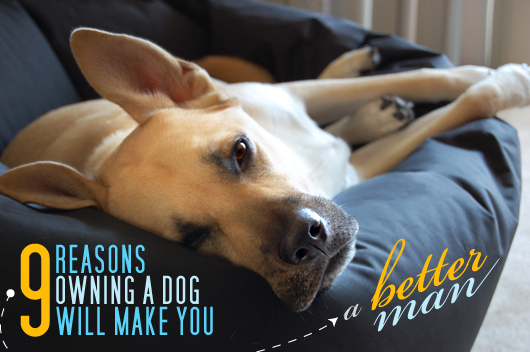 And I’m always making sure I’m GIG! Ha ha ha! i think it is a stupid look,ridiculous…no belt,looks unfinished;pants look too small,too tight,too short,uncomfortable,….But I’m a grumpy old fart who likes comfortable clothing so…. Just my opinion, but I hate the rolled pants, no socks, and dress shoes look. If you are going informal, by not wearing the belt which I think should be done with these shoes, why not wear some white leather sneakers?